Take Some Time to Lend a Hand, and Have Some Fun In Between! It is the time of year once again to give back in an extra special way! In “Very Rare” fashion, I have decided to take up another collection of scarves/hats/gloves/socks for the residents of 2100 Lakeside Emergency Men’s Shelter in downtown Cleveland. I will be dropping off a first batch of donations Friday December 11th, and will drop off a second batch Friday December 25th. For those who want to help out with monetary donations, you can send $1 donations to my PayPal account at vrere@aol.com. Please use the ‘friends & family’ option so you are not hit with a fee. Also please note, if you are using a credit card and not a banking account you will be hit with a service fee through the credit card…if you have any questions please send me a message through social media (I’m on the major ones LOL) or email me at ‘Vreredai@gmail.com’ THANK YOU to those who have contributed already!!! Please refer to the flyer attached to this post for the list of food items that are needed; it’s a lot! 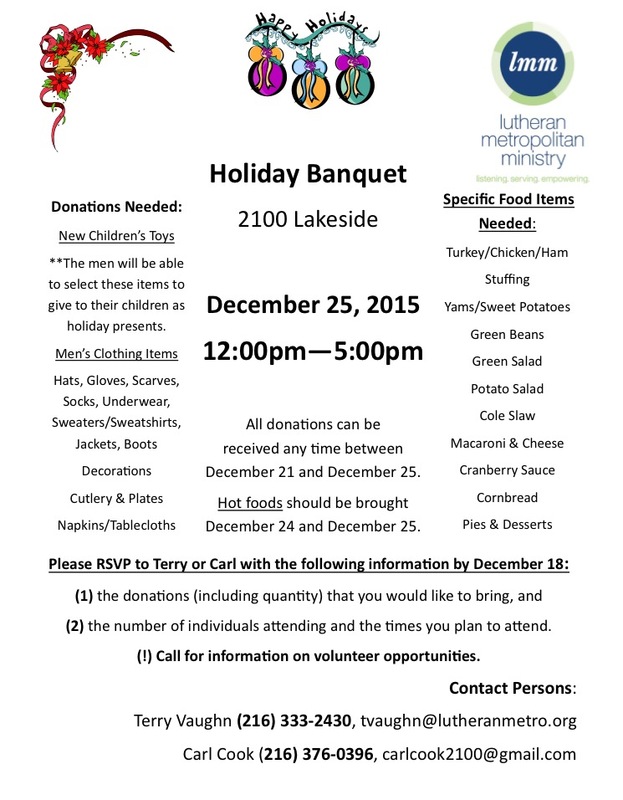 If you have donations and/or would like to come volunteer at the banquet, please email Terry Vaughn (tvaughn@lutheranmetro.org, 216-333-2430) or Carl Cook (carlcook2100@gmail.com, 216-376-0396) with the donations you would like to bring and the number of individuals attending and the times you plan to attend. I’ve had a few parents approach me asking for opportunities for their children to rack up some community service hours for school, so I thought I would share a few upcoming ways to give some of your time back before the Cleveland weather we have all come to love (did I spell hate wrong?! LOL) does its thing…if you have any questions about the contacts I’ve listed at the end of each opportunity in bold, let me know! On Thursday October 1st, help middle school and high school students with their math homework after school at the University Heights branch. Under the supervision of library staff, volunteers will be available at least one hour a week to help students with their math homework on a first-come-first-serve basis. 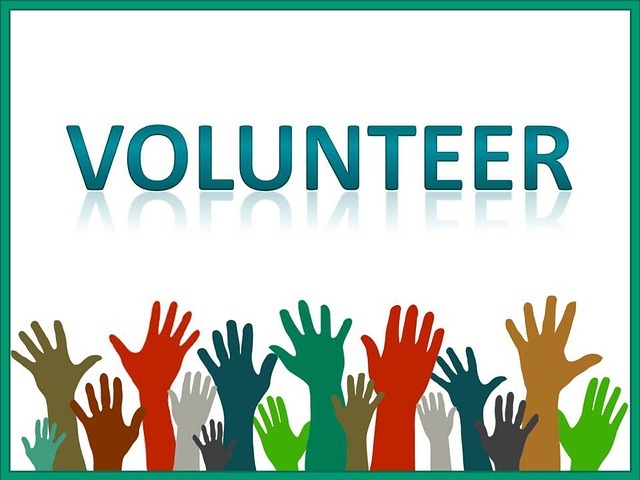 Volunteers must be age 18 or older and must submit to a background check, and must have demonstrated experience working with high school students and/or math tutoring experience. Volunteers must be available at least one hour a week at a predetermined time after school at the University Heights branch, and commit to helping through the full school year. Contact Julia Murphy at JMurphy@heightslibrary.org. On Tuesday October 20th, volunteers can help give out fresh produce with the Cuyahoga County Department of Public Health. This opportunity takes place the 3rd Tuesday of each month from 3:30pm-6:30pm at the J. Glen Smith Mobil Food Pantry (11100 St. Clair Ave. Cleveland OH 44108). Connect with Kathy Rothenberg-James at krothenberg@city.cleveland.oh.us or at 216-664-2362. *This is a great opportunity for students in need of community service hours and happens once a month! Saturday evening, November 21st is the fundraiser for PAWS-Public Animal Welfare Society at St Michael Woodside Party Center in Broadview Heights. They are looking for help with the reverse raffle/silent auction that night during the dinner. Volunteers will be shown what to do when they arrive. Please contact Susan Boyle-Treasurer at treasurerpawsohio@yahoo.com for additional information. On Thursday October 8th, the Lee Rd. library branch (2345 Lee Road, Cleveland Heights OH 44118) has put together a fun-filled evening celebrating Alice In Wonderland’s 150th anniversary. Families register for a 30 minute time slot in this “walk-through” program and 12 volunteers are needed that evening (5:30-9pm) to help with crafts, reading stories, working at the sign-in table, passing out cookies and juice, dressing up as characters, running the croquet game, and running other games. If you’re interested in volunteering for this one-time family program, please email Julia Murphy at JMurphy@heightslibrary.org. Feel free to include your job preference. The University Heights library branch (13866 Cedar Road, University Heights OH 44118) is looking for Math homework help volunteers who are available to assist with middle and high school students at least one hour a week for the 2015-16 school year. Volunteers must be age 18 or older and must submit to a background check. Volunteers must have demonstrated experience working with high school students and/or math tutoring experience. If you’re interested in volunteering for this position, please send a resume of relevant experience to Julia Murphy at JMurphy@heightslibrary.org. A volunteer application will also need to be filled out, which can be found HERE. Here is a quick opportunity to welcome a bus tour of visitors to the city of Cleveland! By way of Destination Cleveland, pop-up parties are set up to show travelers that we Clevelanders are very happy they decided to stop by. I have participated in the past; I and a few others welcomed a bus load of students from Canada outside of the Rock ‘n Roll Hall of Fame. They actually said that in all of their stops to various cities…NOT ONE welcomed them off the bus they way we did! That says a lot about Cleveland, right?! Volunteers will assist Peace Racing with the set-up, maintenance and breakdown of a water stop. Volunteers will ensure participants receive water and will help maintain a smooth traffic flow to avoid congestion near the water stop. Volunteers should cheer participants on as well! Please check-in at the information/volunteer station upon your arrival to receive your assignment and t-shirt. Please try to arrive a few minutes before you scheduled shift time. I know this is over a month away but I wanted to get a head start on seeing if others would like to volunteer with me. On Saturday August 22nd, I will help out once again with Recovery Resources’ annual Run For Recovery, taking place at Progressive Field. This event is put together by Recovery Resources, a nonprofit helping people triumph over mental illness, alcoholism, drug and other addictions. Additional event details can be found HERE. I will be working a water stop along the route; nothing too challenging. If you would like to come along to volunteer with me please send a comment, or reach out to me via social media if we are connected; you can also send me email vreredai@gmail.com to let me know you want to help out. You can expect to volunteer between 8am-12pm (give or take 30 minutes). This Summer, I will be tutoring first and second graders at risk of not reaching the state mandated Third Grade Reading Guarantee. I initially posted a status on Facebook to see if anyone wanted to help out, and there was a pretty good response so I am listing all additional details here. 1-2-3 Read! provides free one-on-one tutoring in reading skills and small group tutoring with literacy games. This 1-2-3 Read! Program is at the Brooklyn, Garfield Heights, Maple Heights and Warrensville Heights branch libraries. There is a particular need at Garfield Heights and Maple Heights. The program starts June 29th and runs through August 6th. There will also be 10 Homework Centers with a need for volunteers to help tutor students in Grades K-8 with their homework. 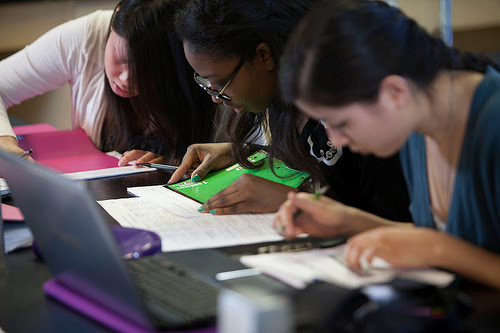 Homework Centers are located at: Brookpark, Brooklyn, Garfield Hts., Maple Hts., North Olmsted, Parma, Richmond Hts., South Euclid, Southeast, Warrensville Hts. If you have an interest in volunteering or know someone who does, an application form will need to be filled out. You can access that HERE. Please feel free to connect with Nicole Joy Beleske, Volunteer Coordinator at 216-749-9400 or nbeleske@cuyahogalibrary.org to send your application and set up a training time. On Saturday morning, April 25th, we will be holding a Pop-Up Welcome Party for a group of students from Canada touring Cleveland. Our welcome will take place at the Rock and Roll Hall of Fame and Museum, and we will be gathering there at 10 am. For those of you who are new, all you need to do is show up, wear something celebrating Cleveland, say “Welcome!” and hold a sign that we will provide for you. It’s really easy, a lot of fun, and we’ll probably be wrapped up by 10:30 am. If you have kids or a pet that you’d like to bring, you are welcome to do so. Weather permitting, we will be outside. If it rains, we may move inside the lobby of the Rock Hall, in which case, please do not bring pets. These welcomes are a great way to show our pride and make an impression on visitors. Guests are always impressed by the welcome, and many take pictures, or want pictures taken with the welcome group. 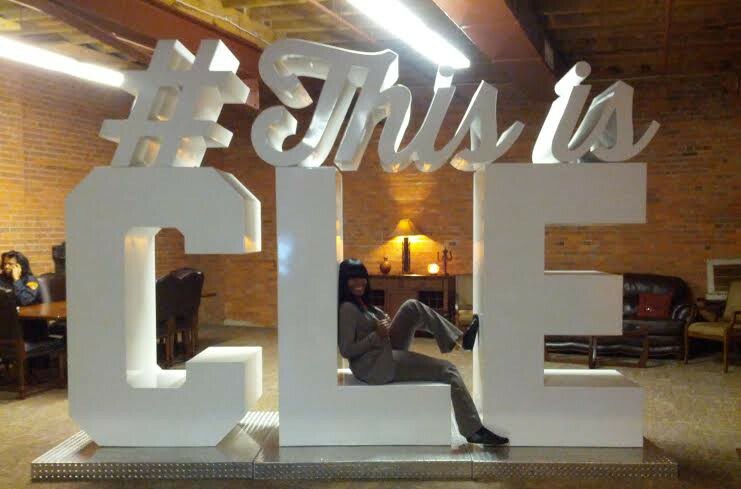 Frequently, we hear the comment, “No other city did that for us!” And that’s what makes Cleveland special! Please note, this welcome will take place outside the Rock Hall and does not include admission, but we do encourage you to spend the day if you are able. Please let me know that you’ll be joining us by e-mailing eembacher@destinationcle.org as soon as possible. I am wrapping up this drive on Thursday April 30th. 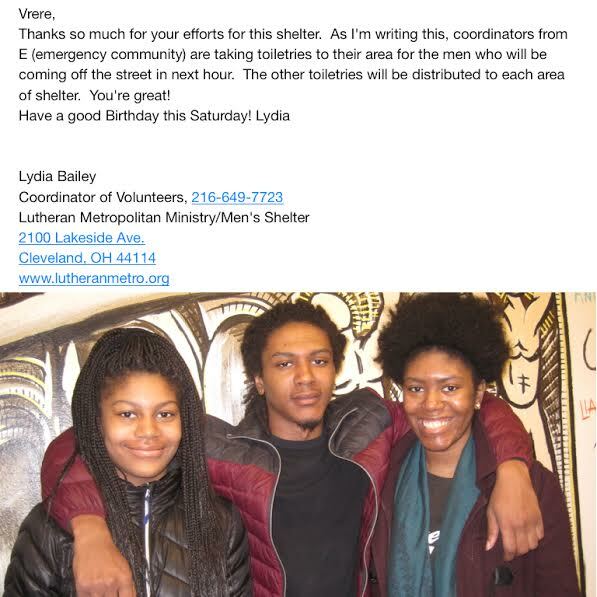 The chapter and I will deliver all donations to the shelter on Saturday May 2nd, in addition to serve lunch for the residents as our Day of Service Project. If you have any questions please connect with me at vreredai@gmail.com or at 216-236-5470. I hope you can help me continue my birthday celebration for the month by giving back to those not in the best situation. If I may get personal for a moment, this has been the most rewarding birthday for me. At 31, I am truly grateful that I was blessed to make the decision to celebrate in a way that benefits others. I promise to keep this going for years to come and make it something bigger, and I look forward to the continued support of my friends and family! #VrereDai Thank You…and Part Two. I had my little brother and sister help me with donation delivery! I just wanted to take time to thank everyone who took their time to support my special present to the 2100 Lakeside Men’s Shelter. I hope you know that am deeply humbled. I was able to collect a monetary total of $330 dollars from family, friends and colleagues via Paypal. That was used to buy 330 $1 items. I also collected many donations from people around town; I believe it was well over $200 worth of items, in addition to a box of books I selected from the bookstore in Gordon Square (Cleveland), Guide To Kulchur. There was so much to take over that I had my little brother ans sister help me out. 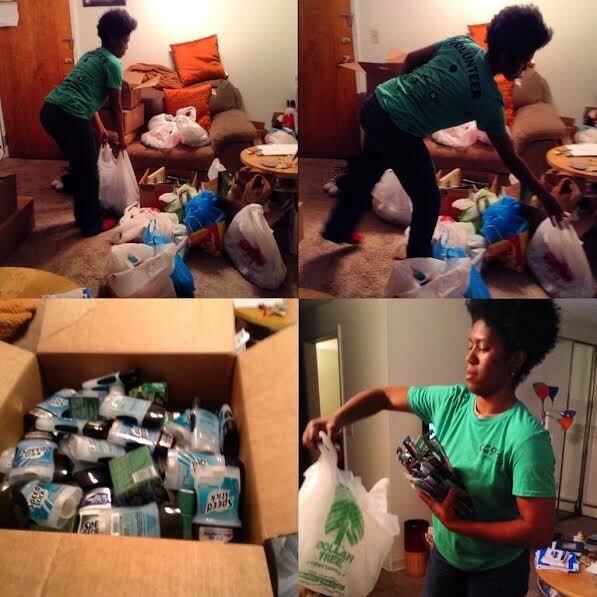 It was good for them to participate in this kind of service and to see the impact it truly has on the community. It’s important that I expose them to giving back. I did not expect to receive so much help-this was my first attempt to start my own drive for a cause. I have signed up tp participate in walks and other activities in the past in which I ask for donations…but this was something I started on my own. It was a LOT of work and I learned things about myself during the process. I’m so grateful I stepped up and followed through. To see so much praise and encouragement for a task like this was overwhelming; it felt really good to grab as much attention as I did and I hope I influenced you in some way to give back on your own. There were many people who were unable to donate to this drive or simply missed my deadline, which was not a problem. Due to that response, I have decided to begin a new drive for the month of April. 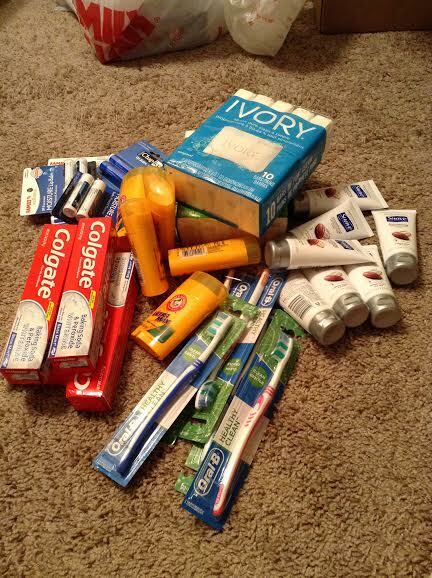 The 2100 Lakeside Men’s Shelter is always in need of items; they support up to 400 men each night. Although the donations collected for this drive was highly appreciated and more than the shelter expected, they will never stop needing our help. I want to extend my “Vrere Dai” celebration all month by collecting items, and monetary donations that I will use to shop on your behalf. If you would like to send money, please use my PayPal account (VRERE@AOL.COM) and be sure to choose the ‘friends and family’ option so your donation is not deducted a fee. The deadline for this drive will be THURSDAY APRIL 30TH.